For those who are on the move, at home, or simply seeking comfort. Or all of the above. So there you have it – the various elements of athleisure wear. While fashionistas and fashion bloggers have been going all out to promote this fashion niche, you might be forgiven for being slightly confused as to how you can do athleisure without looking frumpy (yes, I said athleisure and frumpy in one sentence. No, I am not from the days of the yore). So let’s great straight down to the business of perfecting the athleisure look. (Rolling up my sweatshirt sleeves). Relaxed: This is the main keyword you remember. While athleisure is all about loving your body, it is also all about letting your body breathe. You may want to dress in stretch style leggings, but remember to wear an upper that is less fitted. A crop top in a knit fabric for a work out ready look, or a long vest layered with a crop top in cotton – that’s athlesire for you. Structured: If you thought turning to athleisure is all about looking jaded and un-put together, then you are probably not doing it right. Think of trendy A line skirts in a knit fabric, a cable knit sweater with a round neck number on top, and a pair of sneakers to round it all off. 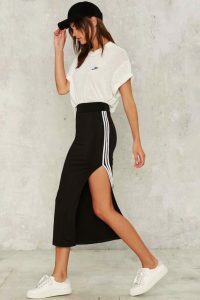 That is the perfect athleisure look for a walk in the mall or lunch with your girlfriends. Turn to asymmetrical hemlines for tops, geometrical panels across leggings, oversized cuffs for jackets, track pant stripes on the sides of your pants and so much more! 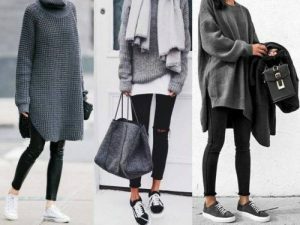 Layered: With athlesiure, you can actually layer your look as per your comfort, the temperature around you and the kind of task you are indulging in. Throw on a chic bomber jacket over a pleated skirt and sports bra or get a sleeveless camper style jacket over a crop top and jogger pants. You could also tie a cardigan or jacket around your hips and rock those cool shorts and tee. Get the picture? Be Busy: The beauty of athleisure is that it gives you the comfort of indulging in a number of different tasks throughout the day. You can actually even take it from one task to the other without going through the hassle of changing outfits. From the supermarket aisle to a jog in the park, from steering your kids home from school to watching a movie with your friends – athleisure lets you mix it all up. So one great way to bring athleisure into your wardrobe is to ensure that you cover all the tasks that are a part of your routine. That way you can pick the pieces that will be comfortable and trendy too. Mix it Up a Little: Who says you have nix those feminine touches while being a staunch athleisure follower? You can throw on some bangles while you combine your hoodie top with those cool jeans. 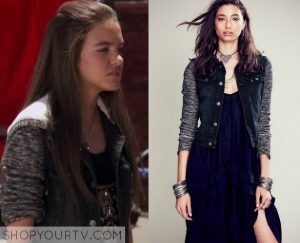 Or you can wear hoop earrings when you combine that floral bomber jacket with a cool jersey dress and sneakers. Sheer crop tops with an all black upper and lower set can also bring out the feminine side of you. I even used a pair of linen jogger pants with a hoodie and a profusion of polymer clay bangles for a colorful and chic effect!